Find hotel near Gold Coast Regional Botan .. The Gold Coast Regional Botanical Gardens is a definite digression that you should take while travelling down the Gold Coast. Located in Benowa, the Gardens are at a close 10 minutes’ drive from the center of Surfer`s paradise. The Botanical Gardens can be explored in various ways. You can enjoy a stroll on the boardwalks around the lake, a children's playground, enjoy picnic or barbecue in one of the picnic areas, and even treat the dog to a play in the off-leash dog area. Guided tour is available by prior appointment. Enjoy the other highlights like smell and touch plants of Sensory Garden and Rose Garden. Take a walk between mangrove to mountain to learn about their local plants and marvel in the beauty of butterflies in the butterfly garden. The friend`s centre at the garden has also recently started freshly grown ground coffee, loose leaves and gluten free treats for its visitors. 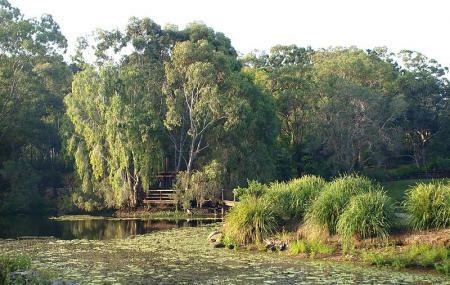 The Botanical Gardens are considered as a heritage by the Australian Government; therefore they introduce new activities to keep the public involved. One of the most recent introductions is of DiG - Discovery in the Gardens – a hands-on science, family fun day with heaps of fun. This initiative also comprises of free shows and activities for science and nature lovers, young and old. Please don’t collect plants or flowers and climb on trees. Please don’t feed the birds or walk on garden beds. Please be aware there is no skateboarding, trail biking or camping allowed. Don`t take drinks to the green area. Closest station - Molendinar Station. Car or bus services from Surfers Paradise and Gold Coast Airport . Love this? Explore the entire list of places to visit in Benowa before you plan your trip. Fancy a good night's sleep after a tiring day? Check out where to stay in Benowa and book an accommodation of your choice. How popular is Gold Coast Regional Botanical Gardens? People normally club together King Tutt's Putt Putt and Jupiters Casino while planning their visit to Gold Coast Regional Botanical Gardens. Just seems like a nice park. Not as lush with botanicals as expected. Nice place for a walk. Lacking in colour and plant variety. Nice for an outing. Free parking. Really nice botanical garden. Good to reach with the car. Nice place for the kids too. Public toilets 🚻 Playground Nice walks along the water and many bridges. Free entry!! Different kind of plants: bamboo, palms... Different animals Very colourful birds. It's a must see if you are interested in botanical gardens. Attractive gardens with an interactive sensory section. There is abundant birdlife, particularly wetlands birds, which complements the experience. Cafe and information centre on site. A nice flat walk or ride from Surfers Paradise.